This article is based on vSphere and vCenter version 5.5 and was performed with vCops 5.7.2. The requirements for the steps in this article are that you have ESXi running with at least one vCenter server deployed and the vSphere Web Client installed. For the vSphere Web Client you must also have installed the Client Integration Plugin because without it you cannot import or export appliances or upload/download files from your local system. A link to install the plugin is available at the bottom of the vSphere Web Client login. 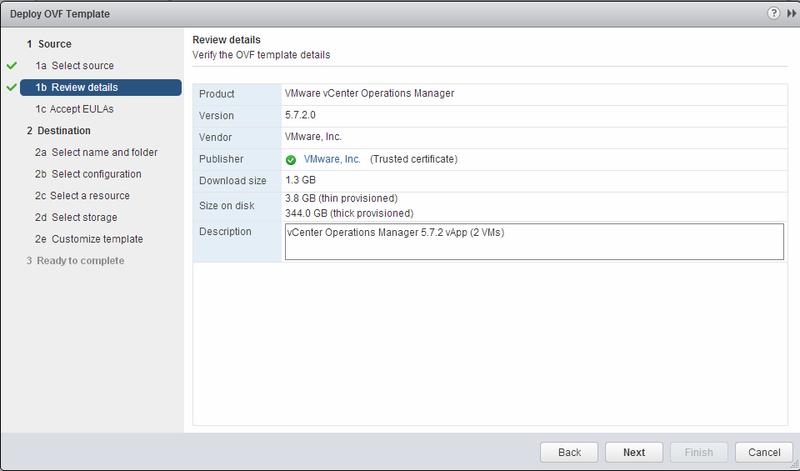 And of course you have downloaded the vCenter Operations Manager appliance. (www.vmware.com/go/download-vcops) Having DNS for the domain you are installing the vCops vApp into is also highly recommended. In the vSphere Web Client browse to the Datacenter-object where the vCops-vApp will run. 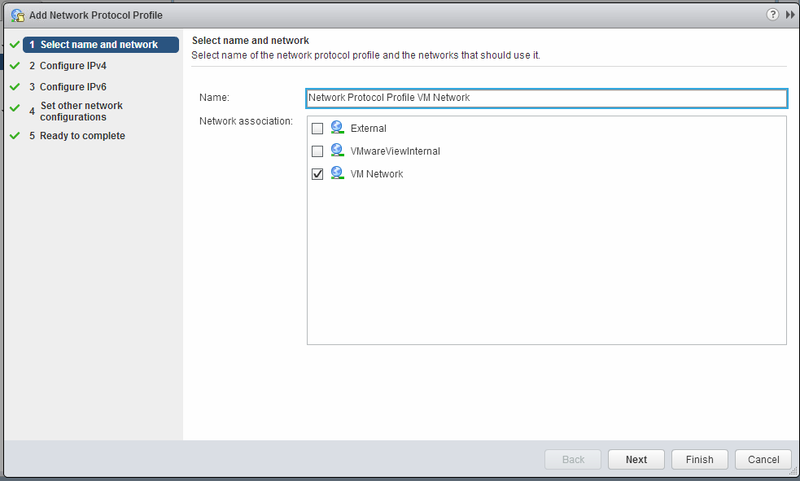 Go to the Manage-tab and select Network Protocol Profiles. Click the plus-icon to add a new profile. Provide a name for the new profile and select the virtual machine port group from the list where the vApp will be attached to. In this example it is the default VM Network. Next provide the IP-addressing details for this profile. The minimum configuration is IP-subnet, default gateway and one or more DNS-servers. It is not necessary to enable the pool since it will not be used to provide addresses to the network, you will specify the fixed IP-addresses when deploying the vApp later on. The details entered in this pool such as the gateway and DNS-server are necessary because these are the settings that will be injected into the vCops virtual machines, without this profile the virtual machines would not have a default gateway or a DNS-server configured. You can skip the IPv6 network configuration. 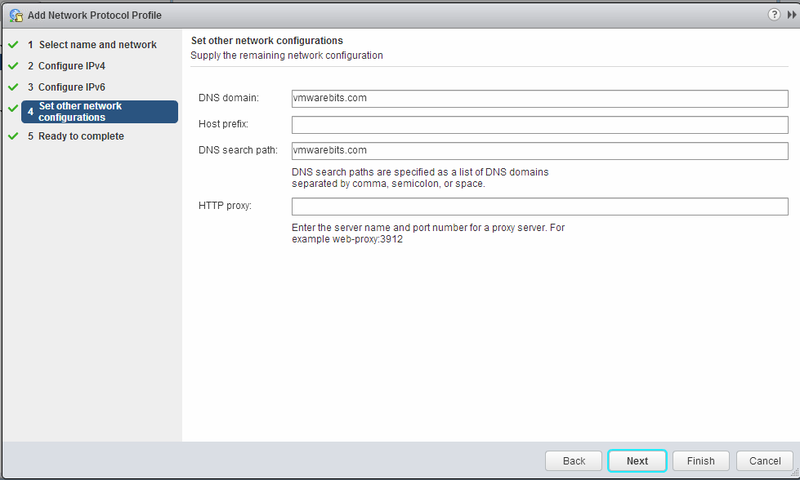 The next configuration items are the DNS domains and DNS search paths for the vApp. Review the settings for the profile and click Finish to create the profile. It is not absolutely necessary to create the Network Profile manually because when it doesn't exist the deployment wizard will create one. But when you have manually created the profile then you also know where the vCops vApp depends upon so it is less likely that a misconfiguration might occur. For example if you move the virtual machines in the vApp to another network without a profile you would receive an error. Because you have created it manually you now know why. Now it is time to import the vCops vApp. Right click the Datacenter-object or select Actions from the top-bar and select Deploy OVF Template. Browse to the downloaded vCops vApp OVA-file. The deployment wizard will show an overview of the vApp and wil report how much disk space the virtual machines will require depending on a thin- or thick-provisioned disk. Keep this in mind when choosing the disk-provisioning type later on in the wizard. The server and datastore where to store the vApp, also don't forget to choose thin- or thick-provisioning for your disks. 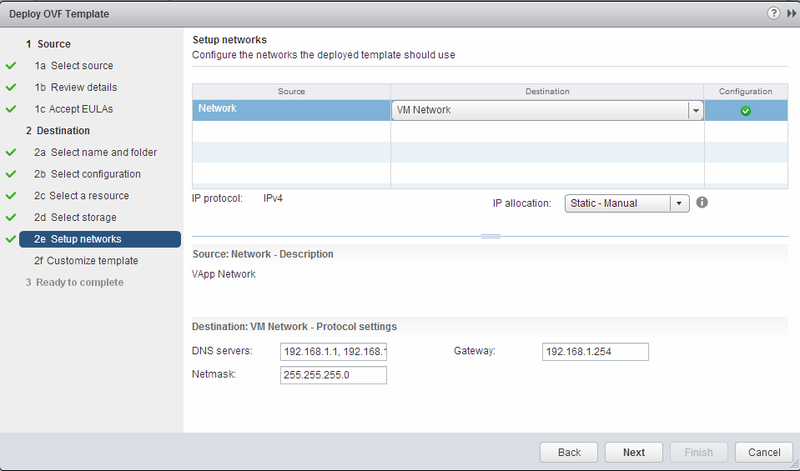 Next configure the network to attach the vApp to and set the configuration to use static IP-addressing in stead of DHCP. This is where the information from the earlier created Network Profile is collected. 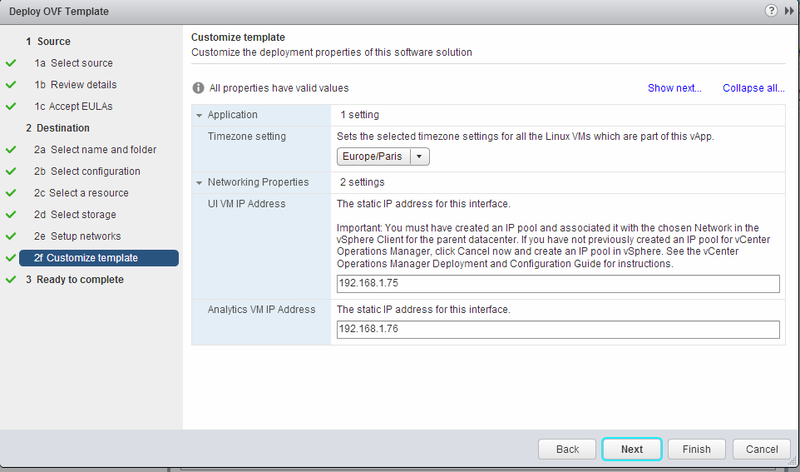 At the last page of the deployment wizard review the information and select to Power on the vApp after deployment. Creating the vApp and powering on the VMs to a full working state will take a while, five to ten minutes at least. In the image below you can see the powered on vApp in the Datacenter. If you open the vApp it will show the two virtual machines that run vCops: the UI-VM and the Analytics-VM. 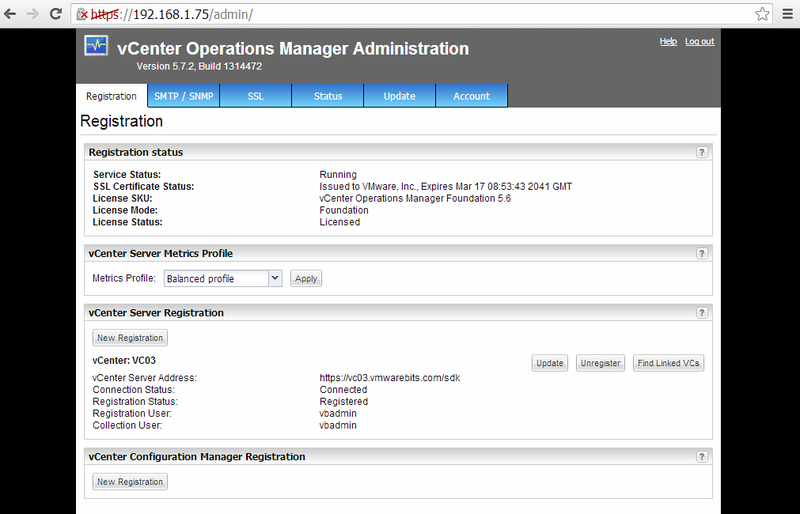 To further configure vCops open a new web browser page to the IP-address of the newly configured UI-VM to access the administrative portal. In this example it is https://192.168.1.75/admin. Login as the admin user. At the first login you will be prompted to provide details for the vCenter server that is used to host the vCops-vApp and the connection to the Analytics-VM, this last one should be filled in with the correct address already. The connection to the vCenter server might come up with a message to accept the server's certificate, which you should do if you can verify that it's the correct server responding. Next you must provide a new password for the admin-user and also for the root user that you can use to login to the individual Linux-VMs of the vApp. The default password for user root is vmware. 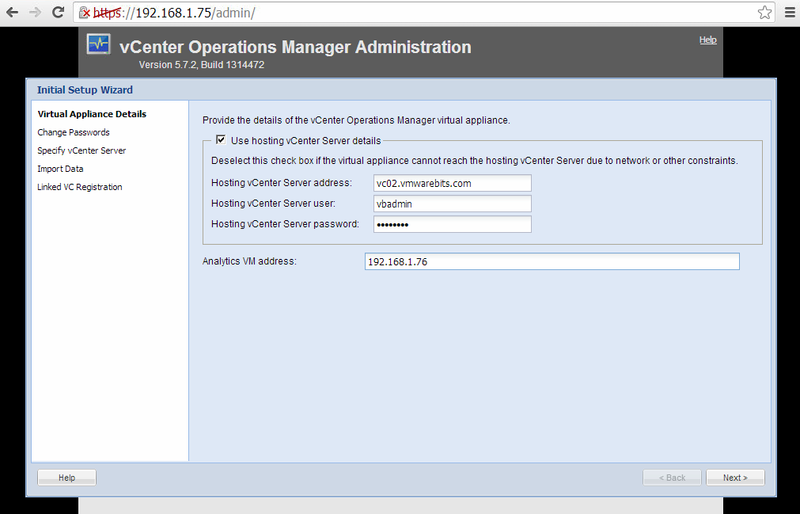 Next provide details for at least one vcenter server that you want to monitor. If there are vCenter plugins or linked vCenter they will be listed and configured in the next screens, if not you can skip that and go to the last screen, click Finish and let the vApp configure itself and connect itself to vCenter. When it is done you can verify that it is running and also that it is licensed in the Foundation-mode, which is default if you did not purchase a vCops-standard, advacned or enterprise license. 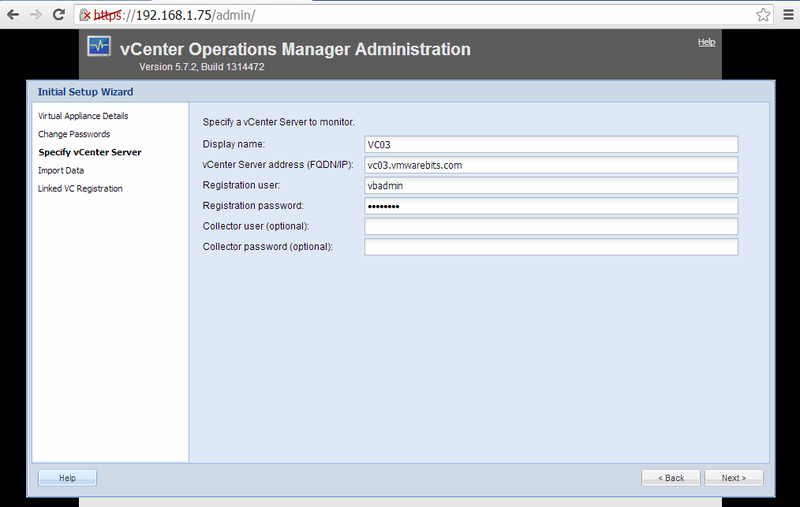 On the Registration-tab you can also add additional vCenter servers to monitor. Next steps to configure now that you are in the administrative portal anyhow are SMTP- and SNMP-servers to send emails or traps to. 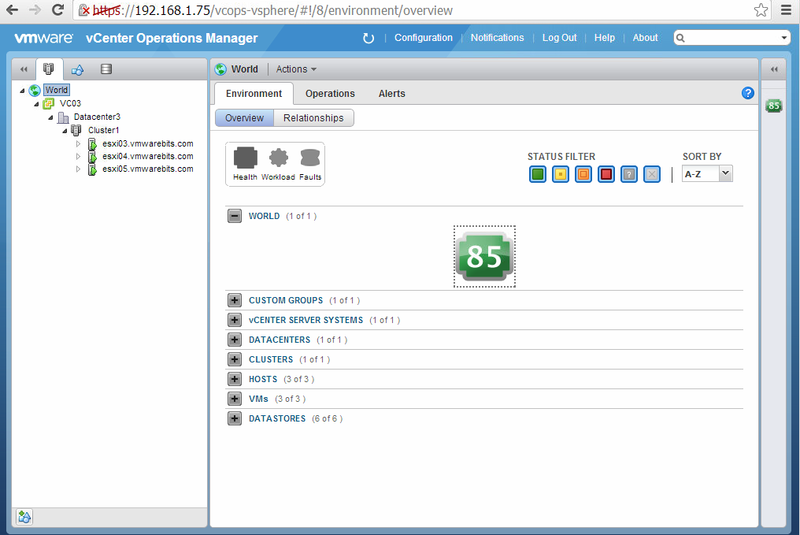 vCops can also be accessed from the vSphere client if you are still using that, and it by the way is to only method of providing other users the embedded admin user to access the vCops environment. Creating multiple users is only possible in the custom-UI interface that comes with the advanced and enterprise editions of vCops. 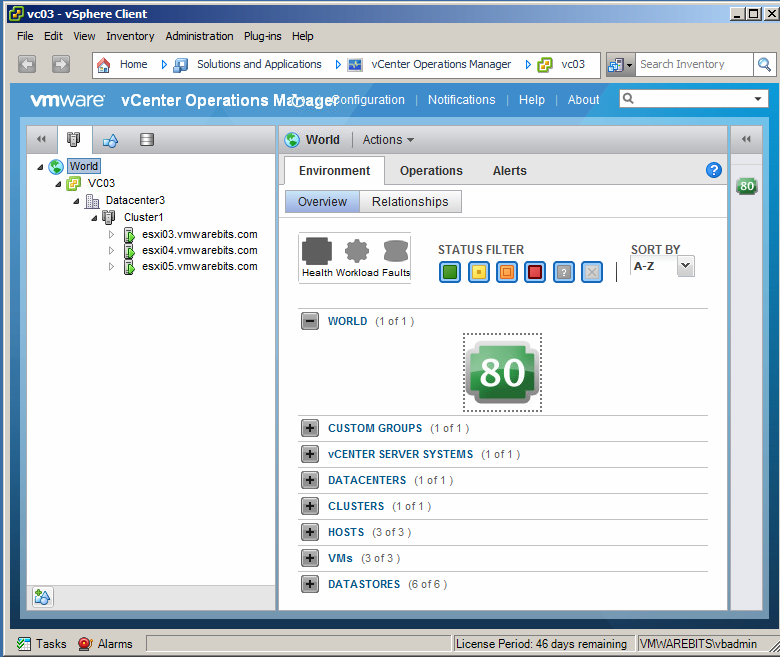 In the vSphere client find the the vCenter Operations Manager icon on the Home-page of the client. To assign access privileges for other users than administrator go the the Roles configuration of the vSphere Client and add the vCenter Operations Manager user- or admin-privilege to an existing role or create a new role. 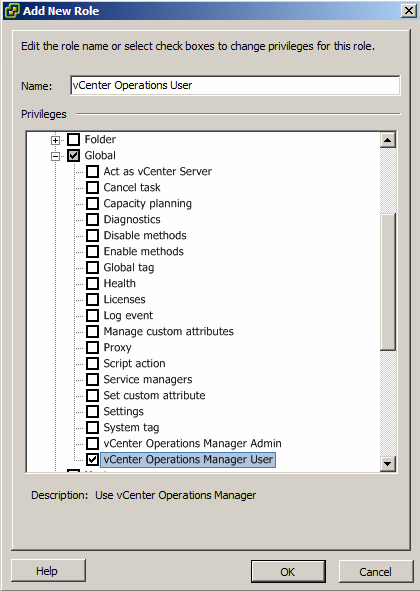 When creating a new role don't forget to assign a new permission in the vCenter-inventory. The user will be able to report with vCops on those objects that he or she also has access rights to in the inventory.